A visit to Dominica (pronounced Do-min-EE-kah) promises to be unlike any other stop on your itinerary. Prepare to slow down, take in the scenery, breathe fresh air, sample fruit right off the trees and experience nature in a way unique to few places on earth. This "Nature Island" measures 29 miles long by 16 miles wide and encompasses about 290 square miles of untamed rain forest; dense, lush vegetation; waterfalls; freshwater pools and bubbling hot springs, heated by the active underwater volcanoes surrounding the island. Much of the interior can only be reached on foot. It's easy to see why producers selected Dominica as a backdrop for two sequels in the Pirates of the Caribbean movie series. As you drive the coastline on roads hacked out of the mountainside, jagged edges plunge into the ocean, as mango trees and ginger root cascade down into the sea. Once off the ship, head inland to visit the island's impressive national parks or into the water to spot plentiful sea life. 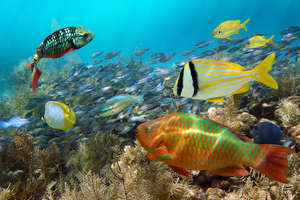 Dominica ranks as one of the top sites for scuba-diving in the Caribbean. Its beaches are mostly rocky. 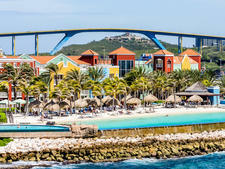 The island features no chain hotels or big-box mega-stores, though there are a Pizza Hut and KFC in Roseau, the capital city. Originally populated by the Carib tribe of Indians, the island gets its name from Christopher Columbus, who first spotted the land in 1493 on a Sunday. (Domenica means "Sunday" in Italian.) In the 1800's, the French and British fought for control of the island. 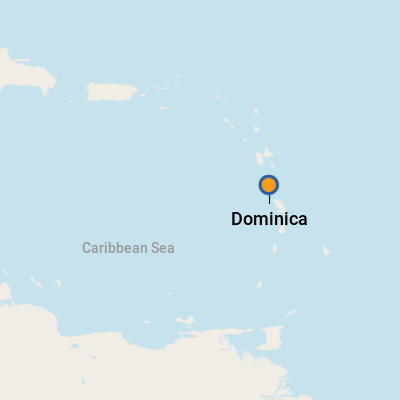 If you glance at a map of Dominica, it's clear by the town names that the French populated the South (Roseau, Soufriere), while the British occupied the North (Portsmouth). Eventually, the British conquered the French portion of the island and maintained control until 1978, when Dominica gained independence. The island still has a Carib population of about 3,000; they occupy a northeastern corner of the island. A drive through this "Carib Territory" will give you a rare glimpse at traditional native life in the Caribbean. Dominica has survived with a predominantly agricultural-based economy that includes bananas. Tourism also remains strong, with Dominica attracting a stream of naturalists who flock to the island to see 172 types of birds, 12 major waterfalls and peaks that rise to 5,000 feet. Whale-watchers also come in hordes to explore the waters that plunge to nearly 6,000 feet right off the coastline, providing an ideal base for seven types of whales that can be seen nearly year-round, including a resident population of sperm whales. Weather on the island averages 77 degrees in winter, 82 in summer, although it's cooler in the mountains, humid in the rain forest and warmer on the coast. The driest months are January through April, but don't be surprised if you experience a brief downpour every day. Most ships dock at Roseau Cruise Ship terminal. It's located in town, just steps away from shops, restaurants and transportation. The Port of Woodbridge Bay, less frequently used, is about a mile north of the city. Some smaller ships may dock at the Portsmouth Cruise Ship facility on the northwestern tip of the island, about 30 miles northwest of Roseau. Travel time is roughly one hour. Colorful downtown Roseau spreads out from the dock. The frenetic little city is small geographically but possesses a high concentration of inhabitants. Cocorico Cafe (Bay Front), right across from the pier, is the closest place for snacks, local arts and crafts, and Wi-Fi. A couple of blocks away, the Old Market ranks as one of the best in the Caribbean. The fruit and vegetable stalls provide a nice photo opp, and the local arts and crafts stalls are good places to pick up souvenirs, including Carib baskets. If you dock in Portsmouth -- the site of a famous battle between the French and English while vying for occupation of the island -- you'll find that the port, located about a half-mile outside of Portsmouth, features a small visitor welcome center and is near some of the only white-sand beaches on the island, as well as Cabrits National Park. Especially when exploring Roseau, watch out for crowded, narrow sidewalks. You might find yourself having to walk in the street at times. Also, remember when crossing the street that cars drive on the left. On Foot: Most of Roseau's attractions are within a 10-minute walk of the pier. By Taxi: Taxis line up at both cruise piers -- certified taxis have either an H, HA or HB on their license plates. The approximate rate is $30 per hour. While there are standard prices set for places like Trafalgar Falls ($25), Emerald Pool ($35) and Champagne Beach ($40), drivers try to increase their earnings by selling tours. Four-hour tours typically will be between $80 and $120 for up to four people; walk a block away from the pier for the cheaper prices. By Rental Car: Operators include Island Car Rental (767-255-6844), which has SUV's available from about $48 per day; Courtesy Car Rental (767-235-7763), which offers free pickup and drop-off and rents Suzuki 4x4's from $54; and (767-275-5337) Road Runner Car Rental, which rents Toyota Rav4's for $59. Driving is on the left, and with the one-lane roads and mountains, distances take longer to travel than you might expect. Also, you are required to pay $12 for a special Dominica driver's license. By Trolley: The open-air Hibiscus Trolley Train leaves from near the pier and does a tour of Roseau, driving past the cathedral and other examples of colonial Caribbean architecture. If it's not filled with passengers on a ship tour, the individual fare is $29.75 per person for a 90-minute tour. By Bus: Mini-buses run by private operators serve as the island's public transportation, and they're fairly reliable. Bus stops are designated throughout the island. Fares range from $1 to $5, depending on the route. 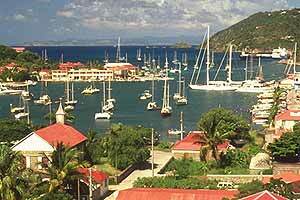 The local currency is the Eastern Caribbean Dollar, which is relatively stable and pegged to the U.S. dollar. For current currency conversion figures, visit www.oanda.com or www.xe.com. There are ATM's in Roseau and Portsmouth connected to Cirrus, Star and Plus networks, which dispense E.C. (XCD) dollars. Banks will also change money. U.S. dollars are widely accepted by most tour operators, restaurants and vendors; however, change may be given in local currency. The language of Dominica is English. However, many of the locals also speak Creole. Creole cuisine is the thing to try. Choose from curries to crabback (stuffed crab backs) and various preparations of callaloo (a spinach-like leafy vegetable). Other treats include fried titiri ackras (small river fish) and bakes (fried biscuits filled with cheese or fish). Several excellent casual restaurants in Roseau offer local Creole cuisine. Among them are Guiyave (5 Cork Street; 8:30 a.m. to 10 p.m.; 767-448-2930); Pearl's Cuisine, located in an old creole house (25 Old Roseau Street; 9 a.m. to 9 p.m.; 767-448-8707); and Cee Tee's Restaurant (King George V Street; 767-616-4500). Note that most restaurants are closed on Sundays. Seek out intricate, hand-woven baskets and grass mats made by the Carib Indians. Be on the lookout, too, for island-made natural beauty products like soaps. Locally brewed Kubuli beer is made with the island's natural spring water and ranks as the pride of Dominica.